Installation for "So Long to the Lumberjacks...and Other Works" exhibition at Three Rivers College in Poplar Bluff Missouri, Jan 25th - Feb 22nd. A large part of my installation So Long to the Lumberjacks is a stage for something false. 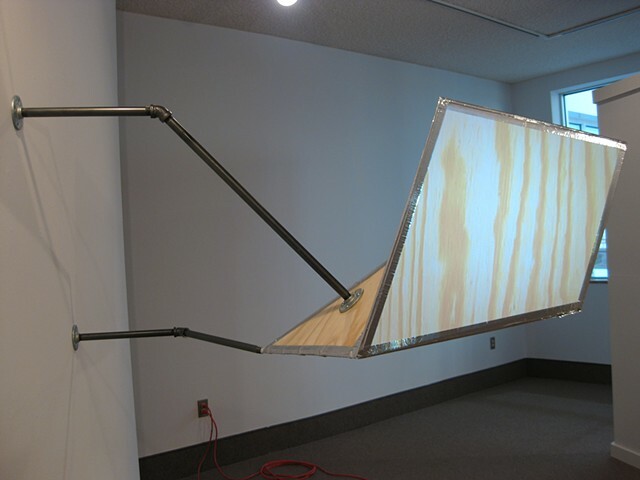 Another part is a digitally projected image of wood grain onto a piece of laminated Masonite. This digital image mimics the surface of other geometric panels of plywood that make up a form suspended from the wall. I see myself working in the tradition of creating faux bois. Making false wood has its roots in the Renaissance with trompe-l’oeil painting. This practice has been happening in three-dimensions since the late 19th century, at least since 1875 when designer Joseph Monier invented a mixture of cement, mortar and grout that was applied over an armature then sculpted to resemble wood. Making materials look like other materials, optical illusions, cover ups, and trickery has been used in design, art and architecture as long as cultures have existed. If materials are selected correctly they can save money and give the illusion of elegance and look expensive. Things are often not what they seem, and sometimes it can be easy to fool an untrained eye. Deception is part of nature and it goes deeper in history than human life. Sometimes the absurdity humans, plants and animals go through to try to cover up a truth and hide identity is laughable. So Long to the Lumberjacks is a comment on that style of deception. It is also an attempt at humor because I am going through unnecessary lengths to make one thing look like something else. A digital image is used to act as one of the most common and inexpensive building materials on the planet.